You knew this post was coming. After all, I've been bombarding your Instagram feeds with Charleston snaps for almost a month now, so a Charleston takeover on your blog feed should come as no surprise. And boy am I bombarding you! I've got things to do, things to see, things to eat, so many things to eat. Oh, and did I mention I have a few pictures? Ok, maybe a few more than few. Possibly a lot. 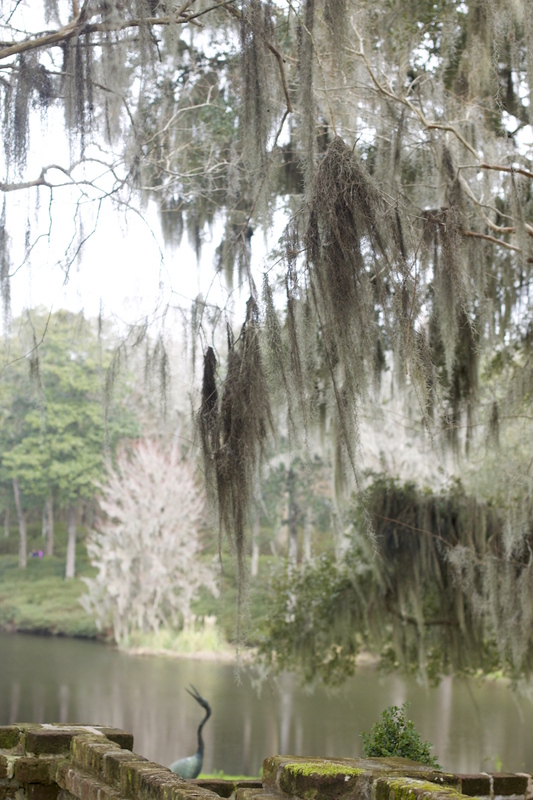 And possibly about 10(000) pictures of Spanish Moss. Oh, and we made a video. I mean, what do you expect from three snap-happy bloggers who go away together to a totally charming, picturesque location?! One quick order of business- a big thank you to all who gave such great suggestions! You guys rock and we really appreciated the help! First things first, we've got to dig into the incredible food scene. The food options were abundant (and that's coming from a girl who lives in New York), and while we got to try so many tasty things, we barely scratched the surface. Guess I'll just have to go back soon ;) But in the mean time, let's both get hungry by looking at everything I ate on my 3x3 trip. FIG- Literally the best minestrone of my life. But then again, any soup that comes with a dollop of cream on top can't possibly be bad! Their desserts (which we stopped to eat on our progressive dinner) are also ridiculously delicious! I'm not particularly a fan of bananas or malt but I couldn't get enough of their Vanilla Malt Cake, and their citrus soufflé with pistachios, blood oranges, and creme fraiche (picture of desserts here) was equally as delicious. Highly, highly recommend this place! Toast- I keep having dreams of their dish, Eggs Meeting Street. Dream about it with me for a second- a fried green tomato topped with a crab cake, poached egg and some kind of deliciously creamy remoulade sauce, served with, quite possibly, the best biscuit that I've ever put in my mouth. Oh, and the other thing in the picture is Grace's stuffed french toast (as in a 5" hunk of bread that has been stuffed and fried). Drool. Slightly North of Broad- The first stop on our progressive dinner was S.N.O.B. (restaurant pictured here) for appetizers and drinks. Their drinks were delicious and well-priced (I got the River Dog). We got the Deviled Shrimp Cake as our appetizer, which, because I like to be completely honest with you guys, was good, but wasn't my favorite. All of their other dishes looked delicious and I'd love to go back for a full meal. Oh, and the bartender was incredibly friendly and helpful. Husk- This was our second progressive dinner stop. We got the corn grits with a soft poached egg and all kinds of amazing vegetables (which I couldn't get enough of), grilled heirloom beans, and a skillet of bacon cornbread (ummm, YES!). Here is the menu for the night we were there. While the food was incredible and I would definitely go back, it should be noted that some of the waitstaff was a bit on the pushy side. Tattooed Moose- Don't be dissuaded by what looks to be a local bar. The food from this place was the bomb.com! We got the Lucky #1 Sub (replacing the pork belly with portobello) and the Lowcountry Cuban along with Duck Fat Fries, because, ummm, duh! The fries, which came with some kind of amazing roasted garlic dipping sauce, were a tad bit greasy but still delicious, and the sandwiches, Oh.Em.Gee. The sandwiches. So good! I go back and forth on which one I liked more and I still can't decide. Poe's Tavern- If you like burgers and fries (and who doesn't?! ), you will not want to miss this place. It's located on Sullivan's Island, which is a bit of a trek outside downtown Charleston, but totally worth the drive. We got the Annabel Lee and Tale-Tell Heart with french fries, their original fry sauce, and the bacon blue cheese cole slaw. YUM!! Zero Cafe + Bar- I can't say it enough, eat here. Seriously. Do it! And before you think otherwise, look at this. Hominy Grill- I wanted to try like half of their menu (ummm shrimp & okra beignets anyone?! ), but ultimately I settled on the totally redonkulous Charleston Nasty Biscuit. It was nasty alright. Nasty good! And probably this close to giving me a nasty heart attack. It was a biscuit with cheddar cheese, sausage gravy, and, wait for it, fried chicken. Done. Dead. Delicious. On a healthier note, I also loved the grilled eggplant sandwich that Luci got. You can see another picture from Hominy here. Christophe- We stopped in many coffee shops to refuel throughout our days, but this was my favorite (probably because they're French and we all know my affinity for everything French). I don't remember the name of my drink but it was half coffee and half drinking chocolate. So smooth, so creamy, so delicious! I planned to come back and try some of their decadent-looking treats, but, sadly, we ran out of time. Charleston Culinary Tour- This tour was one of my other favorite things that we did in Charleston. We had an excellent tour guide who was incredibly knowledgable, giving us a wonderful history lesson as we walked from restaurant to restaurant. This tour costs $60 per person, and with 12 courses being served, I would say that it is well worth the price. It's also a great way to taste some lowcountry favorites (like she-crab soup or shrimp & grits). Stop Three:Leaf Cafe- On the last stop, we were all thankful to start with a cup of chicken noodle soup, since it was cold and rainy on our walk over. We then had a BLT grilled cheese and truffle fries. My favorite dish from Leaf was our next course, shrimp risotto topped with a fried scallop. We finished (or tried to finish, since we were pretty stuffed at this point) with a triple chocolate mousse. Charleston Waterfront Park- Despite the cold and the clouds, the waterfront was still a gorgeous spot. Bonus- some dolphins decided to make an appearance while we were there shooting with Rutledge Social, which totally made up for the fact that my arms, legs, and pretty much entire body were frozen behind feeling. (P.S. I'll be sharing photos from the shoot soon, but in the mean time you can see another sneak peek here). Middleton Place- Ummmmm, what is this place that dreams are made of and when can I move in?! Highly recommend visiting, but to truly see the whole plantation I would definitely suggest spending an entire day here. Also, apparently I found it necessary to take 20 bazillion pictures of Spanish moss....and all I have to say about that is #sorrynotsorry. Plantations- Sadly, we didn't have enough time to make it to all the plantations, but visiting Boone Halland Magnolia Plantation will be at the top of my to-do list when I come back. As with Middleton Place, it seems like you need at least one full day per plantation to truly explore everything that they offer. Ghost Tours-We took a tour of the old jail, and while it was a creepy space, I would say the tour is more of a nighttime history lesson than it is a ghost tour. That being said, it was a lot of fun and I would definitely recommend it. Fort Sumter- As someone who is always intrigued by Civil War history, I was very excited to visit the fort. However, I was little disappointed. It could have been because of the bitter cold and brutal winds or the fact that there wasn't really much to do once you got onto the actual fort. However, I made quite a few dolphin (or porpoise??) sightings, so that was exciting. Shop on Kings Street- There were so many adorable little boutiques, but believe it or not, us three fashionistas barely had time to shop. We managed to pop in to both Luna(how cute is this clutch?! )and Moon & Lola(#flawLESS), both of which were super cute. Pink Dot Beauty Bar- An adorable shop, amazing products, super friendly ladies, and I loved that my makeup application didn't make me look like, well, not me. I'll be sharing more about this store soon, but in the meantime you can see a sneak peek here. Charleston is full of many options when it comes to lodging. The SpringHill Suites (which you can read all about here) is located just across the river, making it super close to all the downtown attractions while still allowing you a little quiet space away from the hustle and bustle. Plus, you can't beat free breakfast and a spot right on the water! While I didn't stay at Zero George, just seeing their property and eating their food is enough for me to suggest it as another great place to stay. Last but not least, The King Charles Inn is a nice option for those who want something located downtown within easy, walkable distance to many of the popular restaurants. And now for the big ol' picture dump.....brace yourself! Other Charleston posts: Charleston Blues, Dreaming in Pink, Denim & Tweed, The 'Suite' Side of Charleston, Zero Cooking School, and Staying Healthy While Traveling. A huge thank you to all of our sponsors and partners who helped make our first 3x3 trip a huge success.